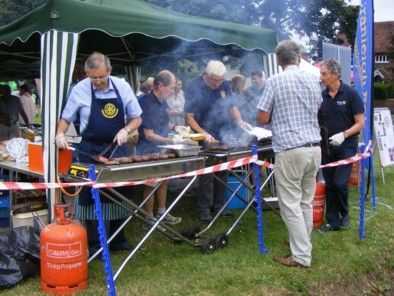 At the Cranleigh Carnival we operated a stall selling barbequed burgers, hot dogs, bacon rolls and drinks. A hard and very hot day's work on the part of the members resulted in raising over £1,300 profit. All of the profits will be used to boost the Club's Charity Fund which is used to help diverse charities and good causes, both locally and internationally. 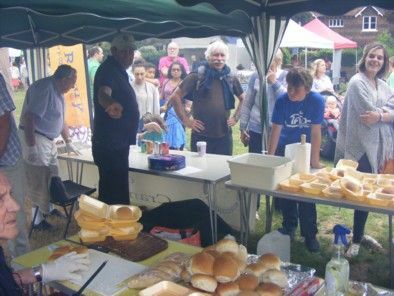 Richard Kenyon, the lead organiser, said, "Once again, we are very grateful to our local butcher, Rawlings, who provided the delicious meats. "The local Sainsbury's was also most generous, donating, free of charge, all of the rolls for the burgers and hot dogs, as well as the cheese slices and onions."